Trades considered on this beautiful 152' Baglietto yacht for sale! : Atlantic Yacht & Ship, Inc.
Trades considered on this beautiful 152′ Baglietto yacht for sale! 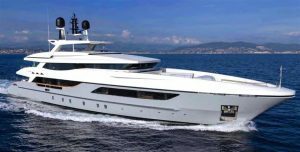 An EURO 500,000 price reduction has been announced on the beautiful used 152′ Baglietto yacht for sale that Andrey Shestakov has available! In the first place, this used 152′ Baglietto yacht for sale is known as “Only One”. As a matter of fact, she was designed by renowned Francesco Paszkowski and Margherita Casprini. As can be seen, even the most discerning yacht enthusiast will love this yacht. After all, this is a perfect opportunity to own a new yacht and not have to wait! In short, you will love how this used 152′ Baglietto yacht for sale is in extraordinary condition. In a word, the layout caters home-style comfort for up to ten guests. This includes the full-beam master stateroom. Additionally, on a lower deck one finds the other four guest suites. Together with the accommodates, this yacht is characterized for outstanding outdoor space. As can be seen by the massive beach club and expansive fly bridge. In fact, the beach club alone is nearly 270 square feet! Looking for a fitness center? This beach club can easily be converted to a gym. For more information on this beautiful used 152′ Baglietto yacht for sale contact Andrey Shestakov today! Just listed: this beautiful used 152′ Baglietto yacht for sale! HUGE price reduction on this beautiful used 152′ Baglietto yacht for sale! EURO 500k price reduction on this beautiful 46m Baglietto yacht for sale!